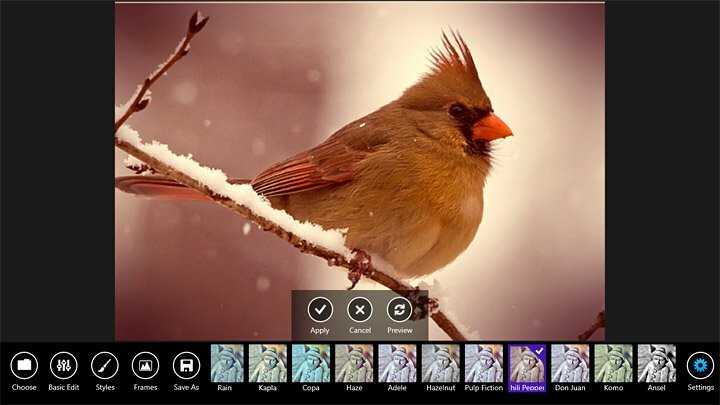 There a plenty of photo editing options available for your Windows Phone. One such option is Fhotoroom. 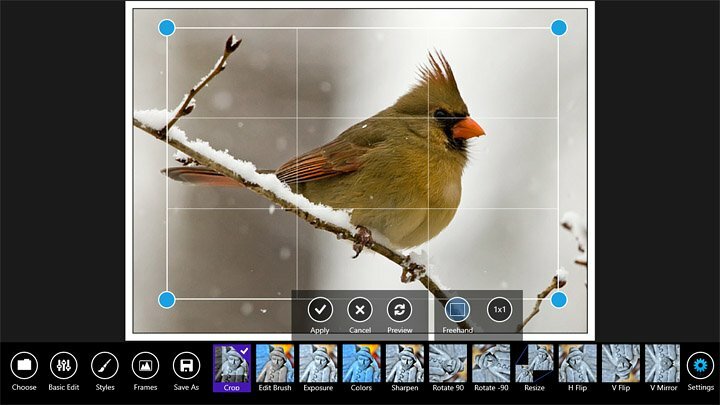 Fhotoroom is a nicely featured photo editor that has recently migrated from our Windows Phone Store to the Windows Store on your Microsoft Surface and Windows 8 PC. We took the Windows RT version of Fhotoroom out for a test drive recently and found Fhotoroom to be a capable photo editor with potential but with some room for improvement. Fhotoroom delivers over seventy six editing tools to Windows RT that covers your basic editing operations (crop, rotate, exposure, etc. ), a wide range of filters/effects, and a collection of framing options. 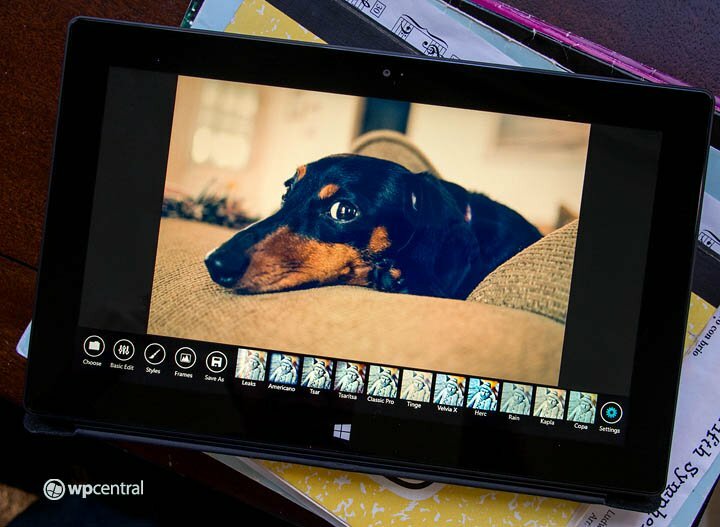 Images can be pulled up from your Pictures Library on your device or from your Skydrive. Editing tools line up across the bottom of the screen with your image taking center stage. Editing tools include crop, exposure, saturation, image rotate, sharpen, flip, mirror, black and white conversion and an edit brush. The edit brush allows you to selective apply effects such as brightness, darken areas, saturation, and softness. Fhotoroom includes forty-two filters and effects ranging from light leaks to haze. The downside to the filters and effects with Fhotoroom is that while you have a nice selection, they can only be applied in one fashion. Fhotoroom lacks the ability to moderate how the filter is applied. You can stack filters but if you only want to apply the Hazelnut filter 50% you can't. Along with the filters and effects, you can add one of twenty two frames that includes Polaroid, line, film, and grunge frames. Once you complete your edits, images are saved to your devices Pictures Library in either .jpg or .png formats. Fhotoroom isn't too shabby of a photo editor for the Microsoft Surface. You have a nice collection of filters/effects and core editing tools to give your photos a little zip. While Fhotoroom has potential, I think it needs to improvements. First, it needs the ability to regulate how much of a filter you apply. You may only want to apply a slight amount of Haze or a lot. Second, and this one is a must, there is no way to zoom into your image. Having the ability to zoom into an area of your photo helps tremendously when you're using the editing brush. You can adjust the size of the brush's area but for those tricky edits, be able to zoom in can be the difference between a great photo and a decent one. While there is room for improvement, Fhotoroom is worth a try. The nice thing about it is that Fhotoroom is a free app for your Windows RT and Windows 8 devices. There is a full version of Fhotoroom without ads and with a few more filters/effects that is running $1.49 and is purchased from within the free version. You can find it all in your Windows Store app.